So you have been putting off the idea of starting a blog, and you have a hundred reasons for it. You don’t have time, you don’t think it would sustain, you think it’s not worth the effort, etc. But there is a desire in you to start something where you write about what you love, express yourself, and you also want to earn from your blog. I passed through the same phase before I jumped into blogging. I almost got tempted to start a blog a few years ago but I did not. I finally could not resist it, and I have begun my blogging journey, which I enjoy immensely on the contrary to my fears. Blogging is something which gives me an outlet while working full-time at my remote job. Talking about something I like and trying to help others was very satisfying. Through the journey, I did realize that it is incredibly rewarding as well. I worked hard to juggle my job and write the posts at night, but it was all worth it when I started to see that my hard work was paying. 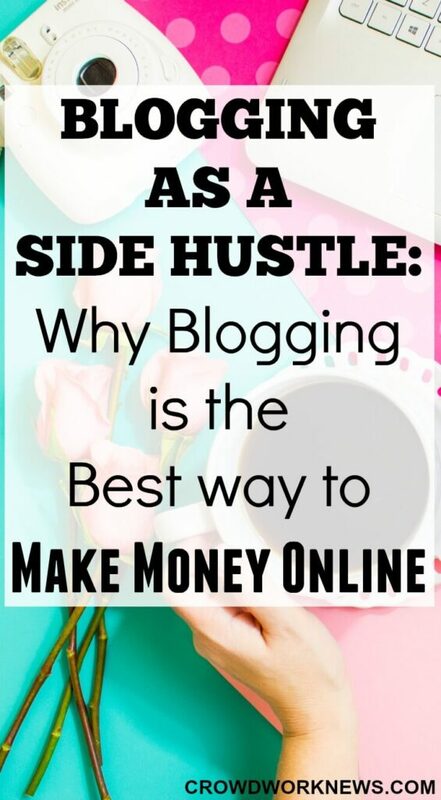 Blogging as a side hustle has been a superb way of making money on the side for me, and it can work out for you too. Let’s take my blogging journey as a case study, though it is for a short period, I am able to make a good income from it. I started my blog in July 2016, now I am in my 6th month of blogging. So far, I have reached some big milestones (tiny for many but huge for me), I have already crossed my last month’s traffic, I am looking at a bigger income this month, and my social media reach is growing slowly. It is because of all the amazing resources, tools and all the support from other bloggers and of course my readers. I could not have seen such a big growth if I did not have so many helpful tools. I do not say it’s easy to earn money from your blog, but it’s not impossible. I could have been at a different place if I started my blogging journey a few years ago, but I feel starting a bit late was for the good. The blogosphere has evolved a lot now, and the opportunities that you see now are infinite. There are lots of things that favor the new bloggers now. Below are the things which would be advantageous to the newbies starting especially now. You always look up to the top bloggers or the influencers in the blogging world. They are the people who inspire you. Most of them started small and had the same or harder times to get to this stage. A few years ago, the digital world was not so evolved, the opportunities to earn a living from a blog were very less. But now, you have all the examples laid out for you to read and learn, test what works and what does not. Influencers in your niche can teach you a lot, and make it easier for you to start your blogging journey. I follow Brittany, Lena and Michelle’s strategies and they have a wealth of information and have majorly influenced my blog growth. When Darren Rowse of Problogger started back in 2003, the social media revolution did not start entirely. Can you imagine if you did not have Instagram, Twitter or Facebook, how would you promote?? That’s the power of social media which luckily for you is here to help. With the different channels of social media, getting the word out about your blog or your niche has become all the easier than ever before and with new platforms like Periscope, Snapchat, etc., it could be very easy to make your blog reach the target audience. This, in turn, bumps up your chances of making more money from your blog. Now comes the interesting and most debatable part. The sky is the limit for your earning potential if you put in hard work and use the right strategies for your blog. The biggest reason most of us fail to start a blog is because of the belief that you cannot make money with blogging. Well, that’s not true, at least now. I started with $400 in my third month, and now I am looking at a much bigger income next month. There are so many ways you can earn with blogging like advertising, affiliate revenue, sponsorships, adsense, products, courses, etc. You just have to figure out which one works for you. Did you know that there are blogs regarding Lego, Fitness around gaming characters, Garfield, Yoga, Horror Movies, you name it, and there is a blog in that niche. And all of these blogs earn money. What is the biggest reason that these blogs are running and making money? They have the audience in their niche. It is possible to make money in almost any niche; you have to find your audience and give meaningful content. So go ahead, brainstorm all your ideas and start writing. You might be overwhelmed by the tools out there to help you in your blogging journey. Right from starting a blog to reaching out to your target audience, you have all the things that make it easier for you to make every process automated and organized. Things like hosting, themes, productivity tools, social media management tools, plugins, etc., there are so many that now you can choose the ones which suit you. The best part is, none of them cost you a fortune, so even if you are starting out on a small budget, you can afford them. It is always so inspiring to see someone new achieve something. It makes you do things which you always thought you couldn’t. Right?? You have many bloggers starting every day and making it happen such as McKinzie of MomsMakeCents (2016), Aliyyah of Rich and Happy Blog ( 2016), Carly of Carly on Purpose (2016) and more. All of them started out either to talk about their hobbies, their interests or to help others. They draw inspiration from one another and create great content to help others in the blogging world. For example, Carly’s Pinterest Strategies is what made my Pinterest traffic explode. It is the best time to start now, just get your ideas in line and start off. You have all the help and inspiration you can get out there. How did your blogging journey start? Please share in the comments.